There’s a magnet on my refrigerator that pictures two sweet-faced, pony-tailed girls, perhaps sisters, grinning in a knowing way that suggests they’re sharing a private joke. Beneath the image is a caption: First we get better grades than the boys, then we take their jobs. My mother gave me the magnet as a stocking stuffer a few years ago, a gag gift that nodded toward the girl I’d been: bookish, ambitious, unwilling to defer to male authority. But according to certain media reports, the sentiment isn’t so funny. “The End of Men,” a recent article by Hanna Rosin from The Atlantic, questions whether we’re moving toward a matriarchal society in our post-industrial economy—and whether men will be able to adapt. Rosin notes that U.S. women now earn more college degrees than men and, for the first time, outnumber them in the workforce. Yes, men continue to earn more, but they also lost three-quarters of the jobs eliminated in the recession, with working-class men particularly hard hit. As American women have entered universities and the workforce, they’ve redefined our understanding of womanhood, Rosin argues, whereas the ideal for men hasn’t changed much over time, even as their opportunities have. like a blizzard, and my father said there’d never been such a fire, a perfect bonfire to toss all our worst memories into, he said, and set fire to them in a flash, and for all time. The novel is concerned with how the past both molds and haunts us, and evocative images like this one appear throughout the book, giving it the dreamlike, visual feeling of memory. As Tullio shares his memories and secrets and Marco recalls his own, the story moves around in time, always returning to the ritual of the bonfire. Through what they reveal to each other—and what remains unspoken—father and son create a shared narrative about how tradition binds them, both to each other and to expectations about what it means to be a man. It’s fitting that most of the novel’s action occurs in the past, because Marco’s and Tullio’s relationship exists more in memory than in the moment. In post-war Hora, the ethnic Albanian enclave where Marco’s family lives, men are still the providers for their families, and women still the caretakers. We get a sense of Hora’s rich culture through the descriptions of holiday rituals and food and the Arbëresh phrases that Abate weaves into his prose and that Antony Shugaar has elegantly preserved in this translation. But the idyllic rhythms of life in Hora are under assault because there’s little work to be had. So men like Tullio seek work abroad (France, in his case) and return home only for extended visits around the holidays. The hopeless circumstances that force many southern Italians into the emigrant life are an abiding theme across Abate’s body of work. 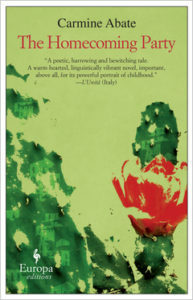 A native of Calabria, the southern Italian region where this novel and many of his other works are set, Abate himself immigrated to Germany at a young age before eventually settling in northern Italy. The story alternates between Tullio’s and Marco’s perspectives as we piece together their history and the painful memories that Tullio wants to burn in the fire. He shares secrets with Marco: Tullio was married once before, and his older daughter, college-aged Elisa, is the child of his first wife, not Marco’s mother. He has gotten into a bloody fight with Elisa’s married lover and would have killed the man if he had the chance. But these actions are not what Tullio regrets. It’s what he didn’t do that torments him. Fulfilling his primary duty as a father—earning money to support his family—means abdicating others: being a constant presence in his children’s lives, teaching Marco how to be a man, protecting Elisa from harm. “I thought I knew you well, and instead I didn’t know anyone, not even myself, if I think about it carefully,” Tullio says. While Tullio unburdens himself of his secrets, we gradually realize that Marco still holds onto his own. Marco recounts vivid stories from his childhood, about playing in the ravine with his dog, chasing after his soccer ball, hunting with his father during holiday visits, surviving a life-threatening illness. But these memories are just pictures in his head; he doesn’t share all these details with his father. Here we go, I thought: maybe my father wanted to draw me out, because he lit another cigarette and said nothing for a very long time [. . . .] I talked to fill the silence with the words that my father wouldn’t let me forget. I spoke in bursts, my eyes glazed over, as if I was watching myself in a badly edited movie. As their conversation continues, he contemplates telling his father a dark secret: that he shot Elisa’s lover, who was attacking her. “In my mind, I struggled to find the right words: I had to do it, pa, or he would have killed her . . . .” And above all, Marco doesn’t tell his father the truth that would break his heart: he, too, plans to leave Hora to work as an emigrant. As a coming of age story, The Homecoming Party is by turns fatalistic and touching. Marco isn’t choosing his future so much as becoming a man by repeating his father’s choices. In the novel’s final chapter, Tullio reveals his big surprise: he’s staying in Hora, for good. To mark the end of his emigrant life, he tosses into the bonfire the suitcase he took on his travels. He thinks maybe he’ll start a cinder block factory, and Marco can work there one day, too, so he won’t need to leave home. Marco keeps to himself what he’s already decided: “I knew what awaited me one day, and after all, I wasn’t that worried about it. One day, I would buy a faux-leather suitcase. When I was eighteen years and seven months of age, to be exact.” Thus Marco’s education is complete. As a boy, he wanted to be just like his father—and he will be, even if it means suffering in just the same ways his father did. Elisa is the character who displays a sense of agency about the future, studying at university, moving to Paris because that’s what she wants. For Marco, desire seems beside the point, almost inconceivable. He describes how, years later, he used his father’s old gesture to explain why he too needed to leave: “I held my fist up to my forehead, as if I was holding a gun, and waited for him to speak.” The image is bleak, to be sure, but it’s also Marco’s tribute to his father. What Abate seems to want from us as readers is not to judge Marco’s decision but simply to understand it. True, there’s danger in allowing our futures to be constrained by tradition and example, but Abate’s moving novel reminds us there’s love in it too. Marion Wyce‘s review of The Homecoming Party first appeared in TLR’s Summer 2010 issue, The Worst Team Money Could Buy.